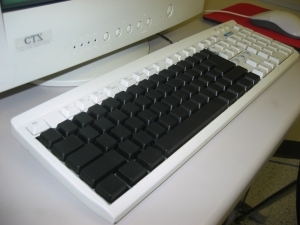 My touch typing students use keyboards that have been painted black so they can’t peek. After more than a year of teaching touch typing and experiencing the frustration of students peeking, I needed a way to cover the keyboards. I tried cloths that were draped over the students’ hands. This didn’t work because the feel of the cloth distracted them. Next, I considered one of the silicone keyboard covers on the market. After I read reviews that they make it hard to press keys, I decided against. 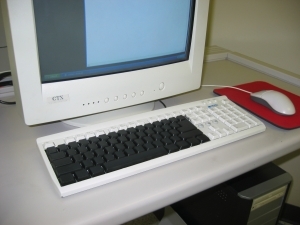 I also considered Das Keyboard, on sale at ThinkGeek but the $80USD pricetag was too much for classroom use. With painted keys, the students have no choice but to memorize key positions. I swap the keyboards out for other classes — the black keyboards are far too intimidating when all a student wants to do is write a term paper. First, I used masking tape to cover the F keys, numeric keypad and other keys I wanted to keep readable. 3″ masking tape is recommended for ease of taping. Make sure to stick the tape very securely around the portion to be sprayed to minimize running on the final product. Next, I used a special spray paint for plastics, applied in about three coats. Hold the can about 12 inches away from the keyboard and use short bursts of spray as you move the can back and forth. Hit the keyboard from all angles to paint the sides of the keys. Wait about an hour between coats. Notice that the keys are painted on all sides. Others have described this process, including the DIY Das Keyboard. Students still need good software or drill practice. A year after the painting project, I added TypingMaster to my arsenal. The combination is yielding awesome results. This article by Megan Golding.